Wide Tarot Bags - Hands & Hearts Wide Tarot Bag - Tarot Bags, Tarot Cards, Cloths, & More! 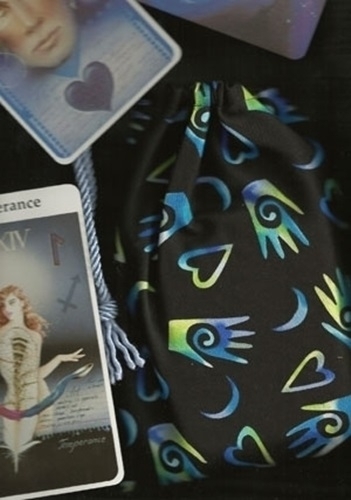 Colorful hands with spirals, crescent moon, and hearts decorate this black cotton bag making it ideal for storing metaphysical & esoteric supplies such as tarot decks or oracle decks, healing stones and wands, ritual items, and personal amulets. Size: Wide, approx. 6 x 8 to 9 inches. Fits decks of 4 x 6-1/2 inches or smaller. It is shown here, for demonstration purposes, with a large size deck, The R�hrig-Tarot. Fabric: cotton. Cord shown is periwinkle. Black is also available.